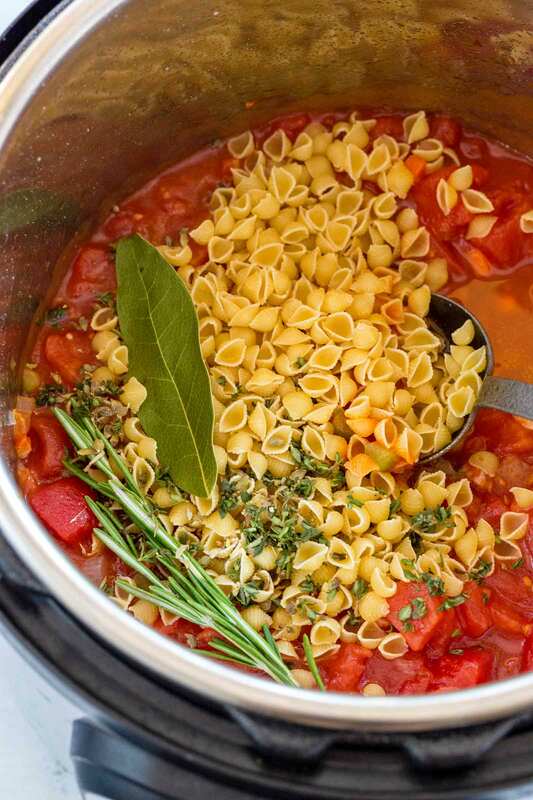 Traditional Italian Pasta e Fagioli (pasta and bean) soup made with ease in an Instant Pot! Savory flavors of pancetta, onions, carrots, celery, tomatoes, herbs, cannellini, kidney beans and pasta infuse and cook together in your Instant Pot or Pressure Cooker. Have delicious hot soup ready and waiting for you when you get home! Each spoonful dissolves in your mouth. 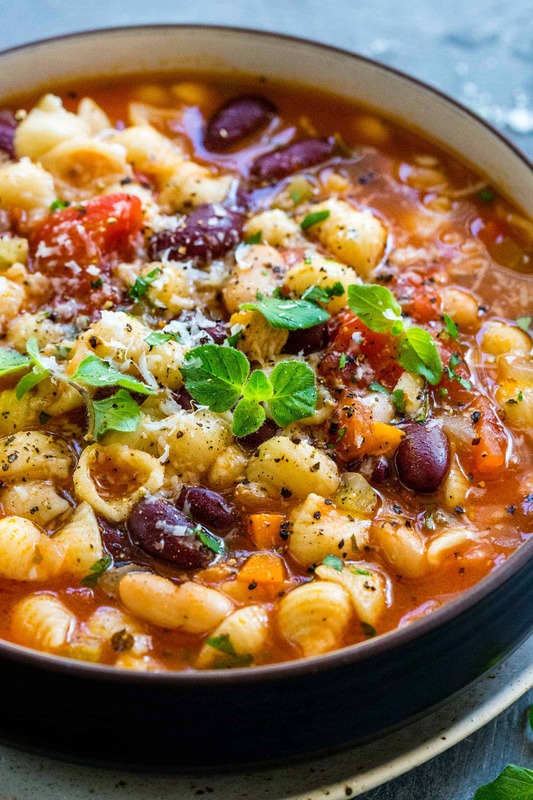 Nothing is more satisfying than a hearty bowl of hot Pasta e Fagioli soup. Bite-sized pieces of tiny pasta, wholesome beans, in a tomato-based broth fit perfectly on your spoon. Each bite delivers a balance of protein, fiber, carbohydrates, and vegetables all in one tasty serving. Hey there! I’m Jessica Gavin, a Certified Culinary Scientist and I unravel the science behind better cooking on my website JessicaGavin.com. I’m thrilled to share this comforting Pasta e Fagioli soup recipe with you. I’ve taken the classic stove-top method and converted it to a simple Instant Pot version. The multi-cooker has multiple functions, perfect for maneuvering through the various cooking techniques needed to master this recipe with ease. You’ll be delighted to discover how the pressure cooker is efficient and cuts back on dishwashing. Use my shortcuts by grabbing common pantry ingredients to make preparation faster and budget-friendly. 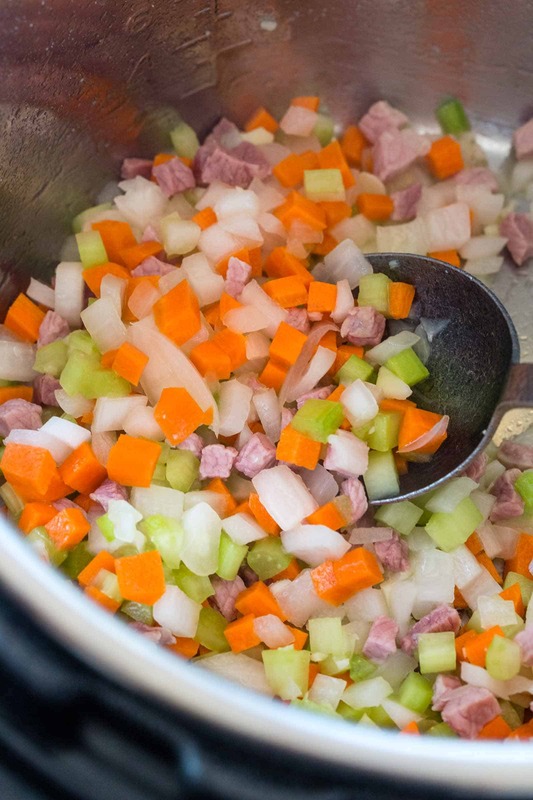 Saute pancetta, garlic, onions, carrots and celery to light brown and intensify their flavor. Cook the dried pasta using high pressure for 3 minutes, and 10 minutes natural release. Add the canned cannellini and red kidney beans at the end of cooking just to warm them, keeping them intact and creamy in texture. With multiple components in this pasta and bean soup, a little bit of strategy is needed to ensure the right taste and texture. Robust ingredients like pancetta, onions, celery, carrots, tomatoes, and dried pasta can withstand brief cooking under pressure. The beans, however, are added at the very end to prevent tiny legume explosions. The Instant Pot makes the soup all in one pot for quick and flavorful results. To save on time, convenience items like canned tomatoes and beans reduces the need to chop or pre-soak. It usually takes hours to cook beans from scratch. I’m not afraid to break out a can opener for those dinner time rush kind of nights. Serve with big slices of garlic bread to soak up the delicious soup! 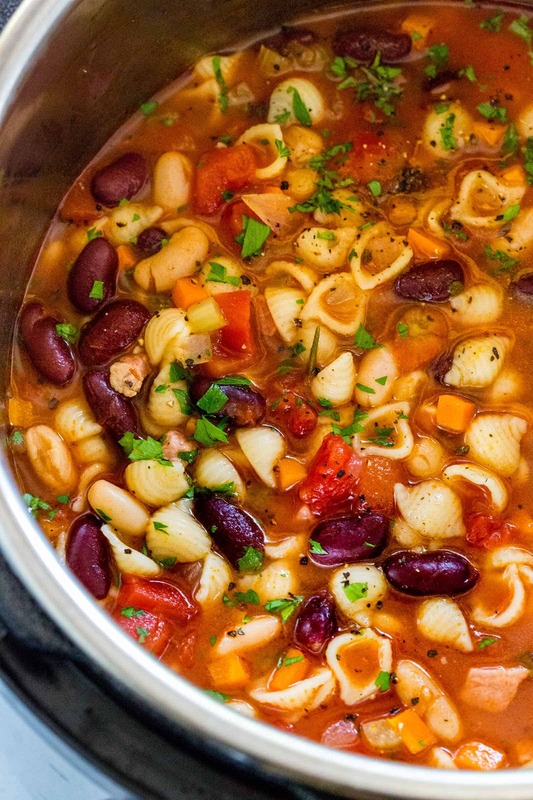 If you enjoy this recipe, I know you will also love my 30-minute minestrone soup too! Need more soup recipes? Try these! 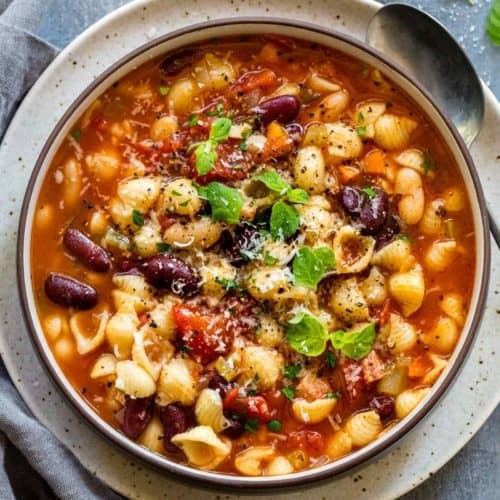 Instant Pot Italian pasta e Fagioli (pasta and bean) soup made with pancetta, carrots, celery, tomatoes, herbs, cannellini, and kidney beans. Select "Saute" on the Instant Pot. Allow pot to heat, it will indicate "Hot" on the display when ready. Add olive oil to the pot, once hot add garlic and onion, saute until fragrant, 1 minute. Add celery and carrots, saute 1 minute. Add tomato paste, saute 30 seconds. Add diced tomatoes, chicken broth, pasta, thyme, oregano, bay leaf, rosemary, and salt. Make sure that the release valve is in the "Sealing" position. Place the lid on the Instant Pot, turn and lock the lid. Press "Manual" button on the Instant Pot on high pressure, and then set the timer to 3 minutes using the "+" or "-" buttons. It will take about 15 minutes for the pot to heat up and build up the pressure. You will see some steam release from the lid, and then the time will start on the display. Once cook time is complete, allow the pressure to naturally release for 10 minutes. Use an oven mitt or towel to slowly and carefully twist the steam release handle on the lid to "Venting" position. The initial release will spray some moisture around the pot so be careful. Add the cannellini and red kidney beans, stir to combine and allow to warm for at least 10 minutes before serving. Taste soup and season with salt and pepper as desired. Garnish soup with parsley and parmesan cheese. I am making this today and don’t see where I add the chopped bacon? I assume that I sauté it first before adding the garlic and onions? Thank you! This turned out great. I had about a cup of leftover pasta sauce I added and rinsed out the jar with red wine. I added about 50% more pasta to compensate for the added liquid. However, I was following the instructions and when I got done I realized I still had the diced bacon (pancetta) left over. In the instructions it fails to mention frying it with the onions & garlic. I fryed it up by itself and added it. Correction needs to be done to the recipe. Drain the beans or add with fluid? You will want to drain the beans. can this soup be made in a crock pot? Yes, that would be perfect with this soup! Enjoy!